Discussion in 'Gadgets & Gear' started by Wasz, Nov 21, 2005. My dad had a set of Im guessing mid-range price Nikon binocs for years. They fell at some point and no longer work. Hes going to be getting a new pair for x-mas and its up to me to figure out what ones, so once again I need your help. They need to be about this size with good optics http://www.binoculars.com/products/Nikon_8x25_Travelite_V_231.html Price range is $250 and down. Thanks in advance. Binoculars tend to be verrry personal. Did your dad love his old ones? Is there any way you can get him into a shop where he can try out some different makes? It would be a shame to get him something and find out it doesn't really "work" for him (and he would know, even if he never told you). Of course, for less than $250, you want to be looking at porros. There are a lot of decent porro compacts, including the ones you linked to. Could waterproofing be important? (It also helps with dust.) A good series to look at, comparable to the Travelites, is the Pentax UCF series. Try to find something "fully multicoated" with BAK4 prisms. If you think he could stand slightly larger binos -- 8x30 or 8x32 -- those few millimeters of aperture can make a big difference. The ones in your link are compact "pocket" binos. Is that what you are really looking for? If you're not buying compacts, consider the weight. I have a pair of Ricoh 7x50's that weigh a ton. I have a large muscular neck so I don't have a problem with them but others who have used them report neck pain if they wear them for a protracted birding hike. What does he use them for? For general use you want something with a fairly wide field of view (maybe 350' at 1000 yards). 7X to 9X power are generally the best - more powerful and hand shake becomes an issue. Avoid "zoom" models. Close focus is generally important only for butterfly observation. These Swift Audubon's are pretty sweet and you can probably find them for $250. What does he use them for? There are very good compacts, mid-size, and full size binoculars out there in your price range. In the full size models, Swifts carry a good reputation from birders. Then there are the Nikon E2's as an alternative. Pay attention to eye relief if he wears glasses and what type of eye cups the bino's have. My dad had a set of Im guessing mid-range price Nikon binocs for years. They fell at some point and no longer work. Have you sent them into Nikon's service center? Their "no fault" warranty will probably fix them for free. Then you could take the money saved and spend on a full size set of bino's to complement the compact model. The Canon 7x42 is a good all round model at ~$180 from Amazon.com. I like Swarovski, but getting back to planet Earth where most of our bank accounts are I usually go for Steiner. Here is a nice one for you, its right on the outer rin of your budget but they come with a pretty decent guarantee. Another Steiner fan. I prefer the smaller and lighter 8X30 Safari. I think its been said a few times on this subject, but quality is DEFINITELY an issue with binoculars. If you skimp on a few dollars now, you will regret it later after a few days in the field when your head is aching, your eyes are watering and you can't spot what others (with quality optics) can see easily. :thumbup: Thats what I have too Excellent clarity and light from such a small glass, and the auto focus rocks. You obviously have excellent taste, Temper! Auto focus is a real plus in hunting (my main use for binocs). I put a small dot of Loctite on the focussing rings about 2 years ago, and the focus has never been lost since in all sorts of weather conditions and terrain. If my eyesight changes, Loctite can easily be 'cracked open' and readjustments made. Well, I like Bundaberg Rum too, so you just might be right! Bundaberg Rum is NOT recommended for improved vision, with or without binocs! LOL Reminds me when I was younger drinking with mates. We would say "Seen one yet?" after we had spotted the correct specimen we said in unison 'When I start fancying her, take me home' LOL Ahh the good old days. Ahem, now back the the scheduled programming. I had a very expensive pair of Leica 10x40s before. I sold them, when I got my Pentax WCP 8x32s. The Leicas were way too big, and you really need a rest to be able to use them anyway. Plus, the leicas cost so much. My eyes couldn't see the Leicas being worth 4 times the price of the Pentax. If your binoculars are too big to bring along when you need them, what good are they? I think that is why birders in general seem to really like the 8x30/32's so much. They are also lighter weight so desk jockey's like myself don't tire out as fast lugging them around. Plus, have you ever had a strap cut into your neck? Smaller lighter weight binocular's help prevent that. You can buy various types of harness to distribute the weight of heavy binos. What you show are Compact Binolculars. The Nikon Travelite V 8x25 compact binoculars that you referenced is actually a very fine choice. A good pair of binoculars? Binoculars are a real case of "seeing is believing". and until one actually looks through a pair of good binoculars - "optical quality" doesn't mean anything. I used to buy cheapo binoculars - because afterall the specs say 8x32 or whatever - so they should be as good as other 8x32 - right? Not only that shouldn't higher magnifications like 10x, 16x and even 20x be better to see more clearly? Sometime in the early 1990's I had my friends with 10x, 12x and even 16x binoculars compare theirs with my Nikon 8x23 - they were simply amazed by the Nikon's clarity and brightness/contrast compared to their monsters - not only that we were able to show quite conclusively that one could actually see detail better with the lower magnifcation Nikons (test was to read a newspaper from a distance - the Nikons were able to read much further away when the higher magnifaction binos failed). but one can buy very good compact binoculars easily for under $100 or even under $50..... so why even think about buying cheapos when binoculars last a lifetime? 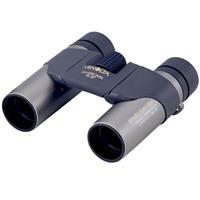 The suggested Konica Minolta 8x25 Water Resistant Sport Mini Binocular can be found for under $50. Compact binoculars are much easier to carry for long periods, since they often weigh half that of full-sized or mid-sized models. Since their objective lenses are smaller in diameter (20mm to 25mm), compact models allow less light to enter the barrels, making for a somewhat dimmer view. For outside daytime use, compacts are a good, lightweight choice, but they won't do as well in twilight or other low-light situations. Outside Magazine's editors call the Olympus Magellan 8x25 (*est. $125) "pretty sweet for tiny binos." Sharpness, clarity and the ability to hold their own in low light make these a 2004 "Killer Buy." A focusing ring positioned a bit far forward was the only negative with these compacts. The Olympus Magellan weighs just 12 ounces, the lightest of any model in our chart. Although field of view is 315 feet, the Magellan's nearest focal distance is 30 feet, so they are not the best choice for closer observations, such as insects and butterflies. Note the take that the Olympus Magellan 8x25 close focus is 30ft may be wrong - check Olympus's own specs which says 3m (=~10ft) - but please confirm this for yourself before any purchase. and as already mentioned I like the Nikon Travelite V 8x25 compact binoculars.